Our Cricket season is officially with us, with a number of important dates coming up. I will be starting my weekly emails from now as well, to ensure everyone is aware with what is happening at Nuna. If you know of any family who is not receiving my emails, please let me know. 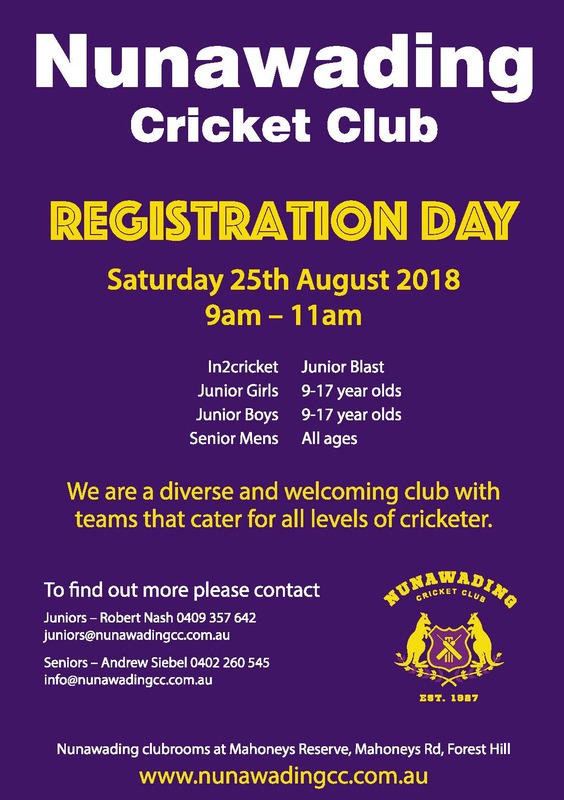 As mentioned previously, our Registration Day is Saturday 25 August September (9.00am – 11.00am) at our Club Rooms. Please come and register for the season ahead. It is imperative we know who is playing at Nunawading this season. We will have apparel there for you to try on and order if you are after new sizes!! Attached is also our Registration Form. If you cannot make it, please complete the Registration Form and return it ASAP. We still are looking for more players, so please bring your friends along!! If you are however planning on not returning this season, please let me know, so that we can better manage our teams. Our first Pre-season training session will be held this Sunday 19 August from 9.00am – 10.15am at Mahoneys Reserve. We will have sessions available for all age groups during this time. If the weather is unsuitable, I will send a cancellation email on Sunday morning before 8.00am. All juniors (excluding those who again will be playing Woolworths Junior Blast – previously known as Milo in2Cricket) are encouraged to come down and start their pre-season training. If your child did Milo last season, however they are now looking for a new challenge, this is a great opportunity to let them try something else – without having to commit to anything!! The new cricket formats for our youngest juniors (Super 7s and Fast 9s) were a huge success last season, and these pre season training sessions, are a great opportunity for your child to obtain a feel as to what the next step of the cricket pathway is like – without having to commit. Sponsor – Do you Have any Printing Needs! !